Successful account executives need to be confident in their abilities to sell a product to customers. When writing your account executive resume, imagine that you’re the product and your customer is the employer. What can you do to pitch yourself on your resume? If you feel your composition skills need some work, try starting with our detailed guide to resume writing. Alternatively, if you’re on a time constraint, use our free resume builder to create yours in under ten minutes. 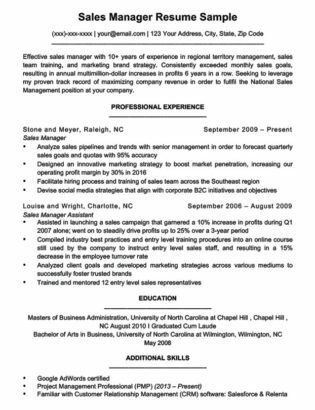 Need a different resume style? 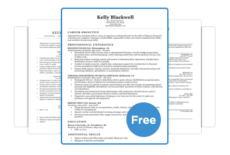 We have many more downloadable resume templates for you to choose from. Browse through our comprehensive list of occupations if you’re in need of more resume samples and in-depth guides. Reliable Account Executive with 3 years of experience in client acquisition and management. Dedicated to meeting clients’ business needs in order to establish long-lasting business partnerships and retain existing customers. Possess a B.S. in Business Administration and NASP certified. Reliable Account Executive with 3 years of experience in client acquisition and management. 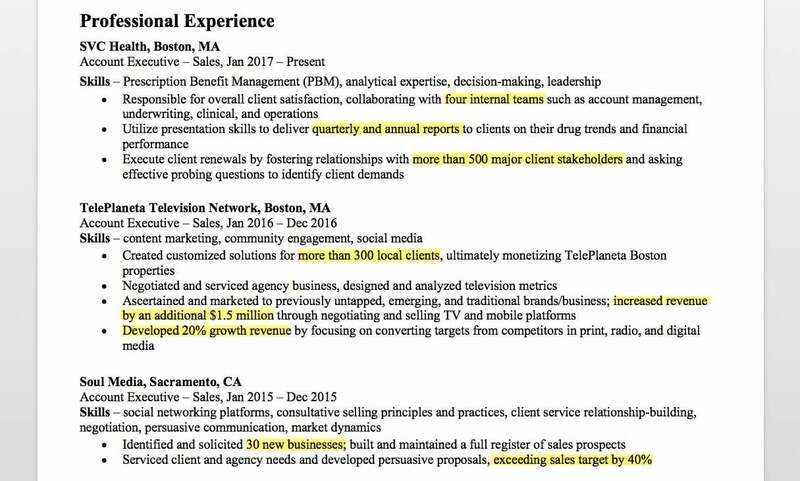 In the first sentence shown above, the applicant states their years of experience and what they specialize in. Dedicated to meeting clients’ business needs in order to establish long-lasting business partnerships and retain existing customers. In the final sentence, the candidate concludes with their highest level of education. Possess a B.S. in Business Administration and NASP certified. Essentially, the career objective should both preview and summarize your resume. We have a complete guide on writing career objectives if you need more help writing one. Providing hard numbers exhibits what you’re capable of. Would you sell a product without explaining how it will benefit the consumer, or giving proof of its effectiveness? Use the same idea for your resume. Don’t submit one with generic statements of your previous job duties – give evidence of how you, the employee, will perform the job functions successfully. Participated in an undergraduate mock business competition and led my team as sales manager; acquired more than 20 new clients and ultimately won first place. Client interaction and Customer Relationship Management (CRM) are examples of highly desirable skills for account executives. Interpersonal skills can be beneficial to your resume just as much as industry-specific skills needed for the job. But what exactly classifies as an interpersonal skill? We’ve compiled a list of the top people skills employers look for in account executives. Providing additional examples of your skills like the ones below is guaranteed to convince the hiring manager you’re qualified for the job. Negotiation: necessary for closing deals on salary, agreements with vendors, or the price of a product. Problem-solving: you can analyze how a situation happened, work to come up with solutions to the issue, evaluate the best course of action, implement the solution, and finally assess how well it worked. Decision-making: you can choose between two or more courses of action using logic or intuition. Public speaking: proves that you are confident speaking in front of groups or giving convincing presentations. Networking: involves building and maintaining relationships with your contacts, especially customers. Leadership: how well you can lead others, motivate them, and build respect among your team. Customer service: you know how to engage and empathize with customers, using clear communication to provide quality services to them. Expanding rapport: regularly interacting with clients to build stronger relationships with them. Verbal and nonverbal communication: your ability to effectively communicate a message and how your body language affects that message. Persuasive: convincing others to commit to something, take a certain course of action, or buy a product or service. By now, you should have a better understanding of how to construct your own resume. If you remember to follow these three steps, your job application is already off to a great start. Don’t forget that a stellar cover letter is the second key to securing a job interview. Good luck!